Confession: Today was interesting. I realized just how far I need to go to work on my confidence. I think I underestimate myself constantly. I spoke with my husband today and was ridiculously self-righteous talking about how I have been dealing with my stress levels in a positive way. What a big load of horse manure. I’ve been fooling myself thinking that my anxiety is well-managed but the brutal honesty is that I hide it well. Really well. By the time anyone else sees it, my nerves are epically out of control. Recently I saw this meme and I wanted to laugh, but it really hit home. Today was a perfect reminder of this, and I realize just how much I have to work on. Some of you may know that my back has been killing me. I rode Ferrous the other day, and we had a great time. He was a little fresh due to the break in cold weather, but nothing crazy. A few hours later I had shooting pains down my spine and couldn’t breathe for the pain. I had trouble sleeping and knew that I had to finally get my back looked at by a chiropractor. I thank everyone who responded to my Facebook post requesting suggestions. It really helped to know you all care and the suggestions were amazing. I found a chiropractor and made an appointment. My first session was today. Not only was the entire right side of my body locked up, but my hip and leg were almost an inch and a half shorter because of it. WHAT!!!!???? As I lay on the table while the chiropractor worked, I realized that maybe I don’t handle my stress all that well after all. I’m trying to build my client roster, sell books, and write several more as well as all the work I do with other publications and events. I love everything I do, but it is a balancing act. Oh, and did I mention that I have three children, homework, house, pets, and a husband that all need me? Sometimes it can be overwhelming. Riding my horse is an outlet for me, but that in itself can be a source of stress too if I have a bad ride, become tense, or even become fearful. After my session, I felt amazing and left having booked several sessions over the next few weeks to get me back to baseline. With zero restrictions, I headed to the barn excited to go on a trail ride for the first time in months. After the polar vortex last week, we had a few days of 50 degrees F weather, and wanted to enjoy it as much as possible! Ferrous loves riding on the extensive trails at our barn, and I confess I love it too. His usual pokey attitude in the ring is brightened up and he marches down the path with ears alert. He becomes forward and frankly the happiest pony in the world. He prefers to lead and that doesn’t bother me, although I would prefer he could go in the middle or behind other horses. When I try to encourage a different lineup, he bobs his head aggressively which makes me nervous. Today was no exception. I was used to him on a hack. That is until we went another trail up to the woods. The footing was not great after weeks of freezing and thawing, so it was slippery, rocky, and uneven. He kept trying to trot and he was difficult to bring back. Not too far in I asked the others if we could turn around and head back to the open field, where he is much calmer. They balked, knowing me well enough to prod me a little forward. If I pushed back, we would turn around. But if I really thought about it and said I could handle it we would move forward. I tend to react first with nerves and then find my courage and inner strength. Today was no exception. The trip back downhill was nervewracking. Ferrous didn’t do anything bad. He was just excited and moving quickly at the walk. He wasn’t dangerous or out of control, however, it was enough to make me nervous. Honestly, I felt out of control even with something so minor, and it made me internally panic. 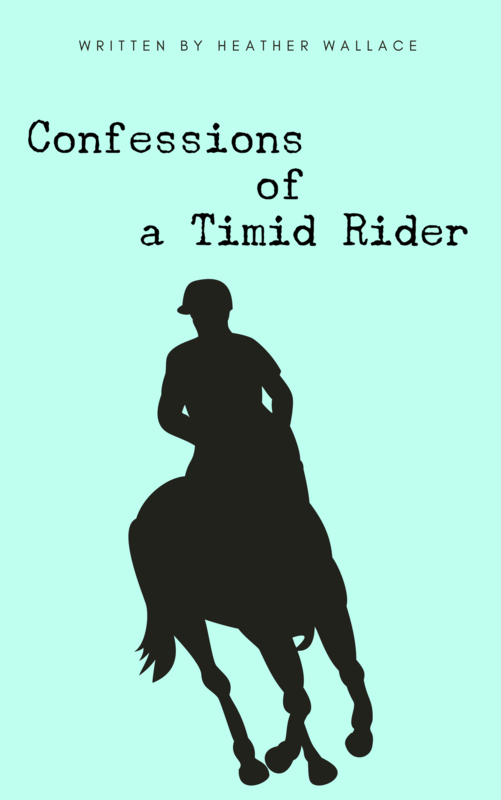 He marched back to the trail loop ten lengths ahead of the other two horses, the mare behind jigging in place. We headed back to the barn, through the flowing and icy stream, and finally Ferrous began to relax. We have 500 acres of property in suburban New Jersey. I’m happy exploring the trails as a pleasure rider. Ferrous is a Steady Eddy, hardly balking at anything but there are always exceptions. I realized as I nervously laughed off his behavior and tried to explain it away that I was trying to convince myself we were okay. The thing was, we were always okay. In my mind I created a bigger problem in my head than there actually was in reality.Did I need to hold him back as much as I did? Maybe. I feel he needs more trail time and lessons out there to calm and listen to the pace of the other horses. After all, this wasn’t a race. Perhaps I should lend him out to my friend training for the Gobi Desert Cup this year and she can enter him in some Hunter Paces? There was no rearing, spooking, bucking or anything like that. My pony just wanted to move. Yet I kept trying to hold him because I was nervous, which then made him frustrated and pull harder. We argued and neither of us was relaxed. That being said, my friend and trainer agreed he might make a good endurance horse after all! He certainly has the drive and passion for it. Me? I have a long way to go. I’m glad my friends wouldn’t let me back off. I worry about everything, and guess what? I proved to myself that I can face a challenge. I think both Ferrous and I could use a little desensitizing to new situations. *Note, many of you have questions about why I would ride a horse I couldn’t handle, or why a fearful rider goes on the trails. So, I wrote a second part to this post to give more information in response to your comments on social media. Read It’s Not My Horse, It’s Me. I really enjoyed this article! You’re not alone in worrying when there’s no need, lacking confidence when we should stand tall and accepting a push (or a helping hand) when we need one. You may see your life as hectic, but it looks pretty darn good from here. Thank you Hindy, I’m glad you understand exactly what I was trying to say. It’s not easy sometimes to admit that I am not perfect. I’m glad you’re taking better care of yourself – and your photos are gorgeous! I’m definitely guilty of hiding stress rather than deal with it, and I’m trying to be more attentive of that as I move out on my own with my dogs – and to understand that it’s okay to need help sometimes. Thank you for the compliment on the photos! As a mom, asking for help feels so odd. I’m happy to hear that you are trying to be more attentive to that yourself. Ferrous is such a beautiful horse! It sounds like he is an “alpha”, kind of like my Husky Icy. She wants to Go, Go, Go and gets annoyed when we hold her back. I don’t have any good tips for keeping calm & carrying on, but please share some if you get any! I’m so glad your back is doing so much better after seeing the Chiropractor, and I’m Glad you had an awesome ride, hope you have many more! He is definitely a smart horse! He is happy to take the middle road in his herd but steps up when he needs to. With me, we have a really cool relationship. He trusts that I have him when he’s nervous. But when I’m nervous he tends to take lead. It’s probably not ideal but I really should learn to trust him a bit more. He’s never let me down yet. I used to be confident around horses until I ended up riding a stubborn, unfriendly one. Now I’m afraid to even try. Oh, that is too bad! It is not uncommon for one bad experience to put a bad taste in your mouth however, I hear this a lot from others. No need to push unless you really want to be involved with them. This post is an excellent analogy of how the human relationship unfolds as well! I’m so glad you are feeling better and getting relief – I was concerned when I read about your back on FB! Thank you! After two sessions I am so much better. I can’t believe how tense and locked up my right side was. I realized just how much my stress internally affects me. You say it perfectly! I get in my own way and need others to help me challenge myself without putting me in danger. I am lucky to have that in a horse and friends! Hello from a fellow New Jerseyan! Ferrous is lovely. I don’t have a lot of experience with horses, but I can totally relate to having anxiety and working with animals. I have two dogs, one who is a little ball of nerves himself, and I’ve found my own anxiety can really complicate how we jive together. I’ve had to learn to try to put my own anxieties aside when I work with him, because I know he feeds off how I’m feeling and if we’re both anxious it just makes everything we do so much more stressful. It’s not always easy. A lot of times during training sessions I feel like we’re working on training me just as much as we are him! It is great that you are taking care of yourself which is something I think many of us forget to do because we are so caught up with everything. I am petrified of horses but reading your post about the ride makes me wonder what am I missing out on. That is nice of you to say! A good hack in the woods is like hiking, just on a thousand-pound animal LOL. A little different than Layla. However, most of the time it is quite relaxing. I totally get the anxiety thing, not as an equestrian – I haven’t ridden since middle school – but just generally. Sadly it does tend to control my life. I applaud you for letting Ferrous take you a little out of your comfort zone. Sometimes it takes a friend, furry or otherwise, to get us past the next step. Thank you for saying so! That is exactly what I am trying to share with my post. Others may feel I’m riding a difficult horse or stepping above my level, however, that is definitely not the case. 99% of the time we are amazing together and he helps to quiet my anxiety. But every once in a while I am reminded that I need a little push to be better and that I can do more. Good luck with your own experience and I hope you have someone that you can rely on. You are not alone. I often feel a mix of excitement and fear riding , especially when my horse wants to run. We all juggle a lot of stress and try to seem ok. I love massage to relax and relieve pain. Everyone should come with a label “What you see if not what you get” because people rarely show their true selves – and it is wrong not to be honest. (and it gets me into trouble). I got tired of being OK, then Dash died and OK was not within the realms of possibility for several years, but I am getting there and if I am worried or scared or concerned I am learning to say so. Back ache – agony. I went straight to a chiropractor because I could not move and I don’t do pain at all well. I need to step outside my comfort zone with the blog and get my courses unfinished and up online. My own version of Ferrous I think! You are so right. People judge us on appearance but that is rarely the truth. Part of that is why I write what I do, because it is important to me that we all talk about and understand that we aren’t perfect and we all have something we are working on or dealing with. Losing a beloved pet is life-altering. I still mourn my Puck. Can’t wait to see what you do with the courses! I’ve been toying with doing an online course myself but want to make sure I do it the correct way and give my readers what they need. So I’m taking my time with it. I, too, wish I knew how to relax and enjoy life. So many people believe I’m so calm and in control, but I hold everything inside and suffer because of it. I hope your back is doing better. Thank you, Paula. I’m sorry to hear but I know exactly what you mean. After all “still waters run deep”. I used to be quiet but was constantly judged and told that I was a snob. So I learned to behave in the opposite way to avoid that censure. That also has its pros and cons. I’m most comfortable reading a book or spending time with my animals. I hope your knee is better! How are Truffle and Brulee? First, to repeat that popular phrase, you are stronger than you think! It’s amazing where we find inner strength from when we are in much pain. And…how well we can hide the pain and anxiety from others, and sometimes from ourselves! I am so sorry for you pain and anxiety…I understand the body pain. I was diagnosed almost 7 years ago with RA and Fibromyalgia, the latter making me think of you for the locked up feeling, pain, etc. To top it off, I fell on black ice a week ago and am now nursing an extra inflamed and pained body and a boot on my ankle. I, too, do holistic treatments – chiro and acupuncture, supplements, and occasional Tylenol or Advil. I do use a fantastic CBD lotion on my brusies and sore muscles and joints. Helps with inflammation, but each day is different. They say a trauma – physical or emotional – can flare Fibromyalgia, so just some food for thought. I do believe anxiety goes hand-in-hand with injuries, pain, and stress. Stress can truly wreak havoc on our bodies! You are actually brave. I commend you for sharing your experiences. Hug Ferrous and allow that animal-human bond to fill you with warm feelings of love and peace. I hope your pain subsides soon, and take some of that stress with it.